As an arch propagandist, Adolf Hitler was happy to see his life recorded in dark shades of grey. The Nazi leader believed that traditional black and white photographs best highlighted the sinister nature of his regime, presenting dramatic images which were both powerful and menacing. Now, however, an altogether more colourful view of the Fuhrer has emerged. More than 62 years after his death in a Berlin bunker, images from a newly opened Paris archive show him relaxing with children in the Eagle’s Nest, his mountain top chalet in the Alps near Berchtesgaden, Bavaria. Hitler is celebrating his 50th birthday party on April 20th 1939. While the dictator does not look in the best of physical health and appears to stoop slightly, the shiny-faced Ayran boys and girls are immaculately dressed in bright pastel colours. All were likely to have been the sons and daughters of Nazi party dignitaries. 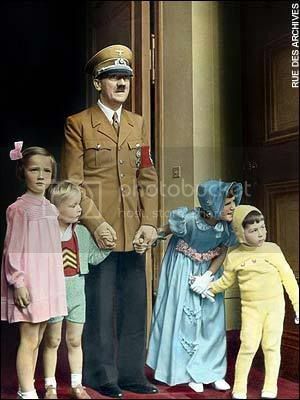 Hitler never had any children of his own, but liked spending time with other people's - forever enthusing about how important they were to the biological future of the 1000 year Reich. His chief propaganda minister Josef Goebbels’ six children were one of his surrogate families, as were the sons and daughters of his architect Albert Speer. Other pictures show Hitler out of uniform, reclining in a pin-striped grey suit and looking over the Bavarian valleys while wearing a Homburg hat. With him in the latter colour portrait is Eva Braun, his loyal girlfriend who was with him throughout the war years right up until the pair took cyanide capsules as Russian forces approached. Also featured in the colour photographs is Hitler’s beloved German Shepherd Dog, Blondie, who also remained with his master until the final hour. The more official looking photographs in the archive show an early rally of the SA - or “Storm department"- the brown shirted mobsters who assisted Hitler’s rise to power in the 1930s. Its leader Ernst Rohm - once a close ally of Hitler - was later murdered by the SS. All of the pictures have been released by the Rue des Archives picture agency which was founded in the French capital in 1936 - four years before Nazi forces occupied Paris. Hitler was one of the most photographed people in the world during the 30s and 40s, and took a close personal interest in all the images produced by his personal photographer, Heinrich Hoffmann. However, Hoffman was not used to using colour, meaning that the Paris batch of photographs is likely to be the work of Hugo Jaeger, who specialised in what was a relatively new technique at the time.